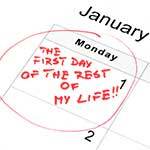 You've had those last 10 pounds to lose for a while now, so seize the day! Our amped up version of the Bronze Eliminator gives you the extra boost you need to help accomplish your weight loss goal. Is weight loss just about eating less and exercising more? 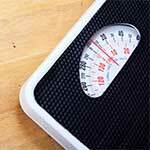 You know those weight loss stories that seem too good to be true? Well, here's a story that you would be tempted to believe is too good to be true, but I've seen it with my own eyes many times. 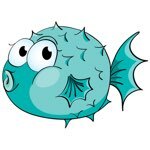 I used to believe that weight loss involved eating less and exercising more. Those are a great start, but unfortunately, not the whole enchilada for many people. People hold onto weight and don't even realize they are undermining their own progress because they don't do one simple thing... sleep at least 7 hours a night. Maybe you have a demanding work schedule, or sleepless children, or stress induced insomnia. What ever the case may be, we've seen many people go from plateau to weight loss goal simply by making sleep a priority, and using some practical tools to help them get to sleep and sleep all night. Our secret ingredient in the 10-Pound Eliminator package is: Melatonin! Proper sleep is one of the very best ways to lose weight, and melatonin will help you sleep like a baby. We have included the pleasant tasting, lemon-flavored NuMedica Liquid Melatonin. Melatonin is a hormone your body naturally produces to fall asleep at night. Screens (think tablets, computers, TVs and even smart phones) tell your brain it's daytime because of the blue light they emit. When blue light comes into your brain through your eyes, it surpasses the production of melatonin in your brain. We always recommend turning those screens off at least 2 hours before sleeping, but melatonin is a great way to beat insomnia, jet lag, or shift work with unpredictable sleep schedules. Sleeping is a proven way to lose weight, and by far the simplest! NuMedica MultiMedica is a unique multi-vitamin that not only nourishes you, but makes sure the vitamins and minerals you are ingesting can be used by your body effectively. Using processes like TRAACS patented chelated amino acids to boost absorption, MultiMedica makes them much more bio-available. For example, this supplement allows a very high absorption rate of magnesium. It is estimated that well over 70% of Americans are magnesium deficient, and taking a magnesium supplement alone cannot be absorbed properly. With the unique blend of TRAACS chelation and buffering, you can get half of your recommend daily dosage. Magnesium deficiency is linked to all sorts of issues such as: fatigue, lethargy, anxiety, depression, food cravings, and even insomnia. MultiMedica is specially designed for the unique needs of women and men having different ingredients for each gender. NuMedica Appe-Curb supports brain balance and an overall sense of restoration, while helping you kick those carb cravings. Whether your weakness is: sugar, tobacco, carbs, or even alcohol, Appe-Curb can help you say "no thank you" to the addictive items that derail your weight loss plans. This package also includes NuMedica hc3 Trim Active Complex with the active ingredient of African Mango Extract. These naturally derived sublingual drops have been scientifically proven to help reduce weight in obese and overweight individuals. Our clients tell us it works even better than the old hc3 Trim homeopathic drops! Who Should Use The Bronze Eliminator? If you are ready to lose weight, and you want to eliminate the cravings that often go hand in hand with weight gain, this supplement package is right for you. By taking a good supplement regimen daily, along with fat burning Active Complex, and Melatonin, you have a recipe for success! Add one of these high-quality protein drink mixes to your daily regimen and use as a meal-replacement or snack. Your pack includes two canisters of the chosen protein type and flavor. Each SlimFit canister has 22 servings for a total of 44 servings. Each Total Vegan canister has 14 servings for a total of 28 servings. Would be great if these canisters were sized to be 30 servings each to allow for a serving per day for a month - maybe they will make it that way one day :). So, for the SlimFit you will have about 14 days of extra servings if you do one per day and for the Total Vegan you will be about two days short. You can of course adjust how often you have a protein drink and/or the amount of powder per serving to your liking to increase or decrease the rate that you use them. The goal is to get high-quality, low carb protein into your diet and to provide you with a healthy alternative to the unhealthy foods and snacks we often crave and are trying to replace over time in our current diet. These NuMedica proteins are an excellent addition to your daily diet even if you are not trying to lose fat and weight. Want to lose weight, but not sure what shakes you can trust? 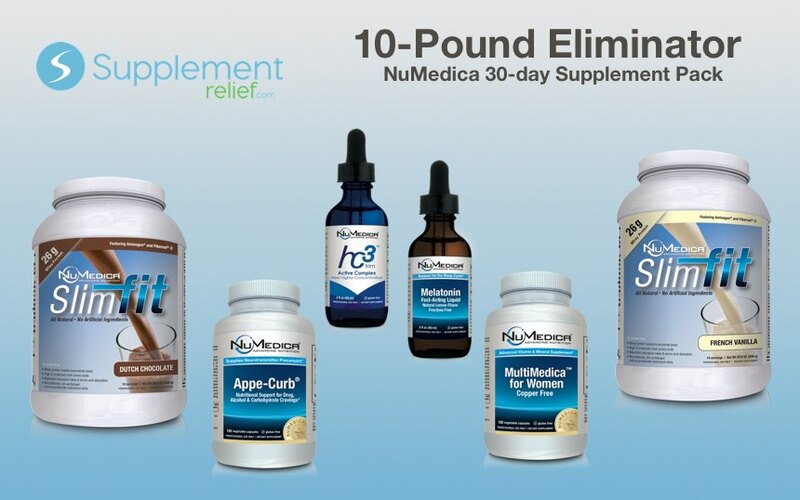 NuMedica's NuMedica SlimFit Protein superior meal replacement shakes come in all of your favorite flavors, and are the highest-end quality you've come to know with NuMedica. 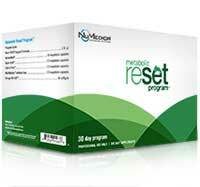 This is the stuff you can get from upscale pharmacies and physician's offices in medical weight loss programs. SlimFit is your very best option for meal replacement, weight loss products. NuMedica Total Vegan Protein is low on the glycemic index, dairy free, nut free, soy free, and perfect for the inflammation reduction you're looking for. Added bonus: it tastes great! How many shakes have you tried that tasted like the cardboard they came in? Liberate yourself from choking down another meal replacement, and ENJOY this shake. Comes in chocolate, vanilla, and now mocha flavors. Mix and match. For added flavor combos, try blending vanilla with different berries creating endless options. 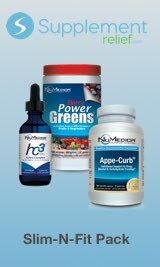 How is the Silver Eliminator Pack different from the NuMedica hc3 Lifestyle Program and the other Eliminator Packs? 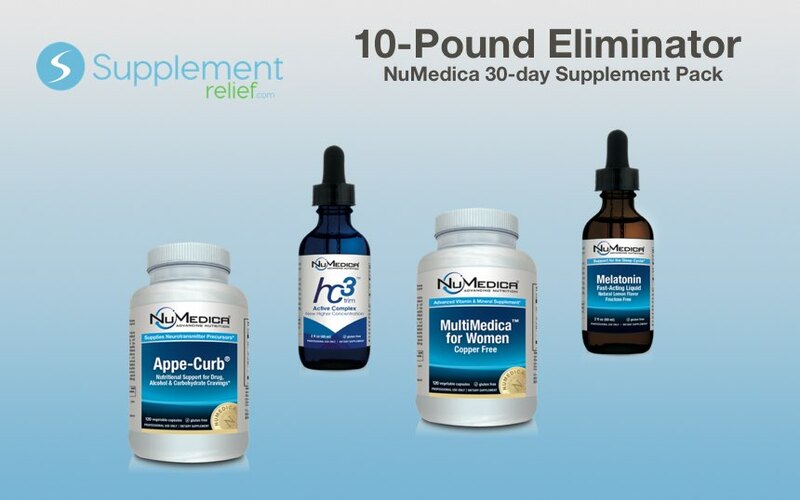 Each Eliminator Pack includes NuMedica's hc3 Trim Active Complex drops as the base weight loss supplement. 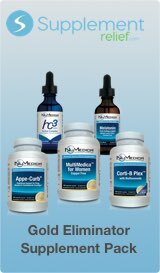 Beyond that each Eliminator Pack uses a different combination and quantity of NuMedica supplements than the hc3 Lifestyle Program. These supplements are similar in many ingredients but are also optimized to provide the best value price point as you progress from the smaller to larger packs. Each Eliminator Pack provides powerful supplements that work together in a synergistic manner to help you reach your Wellness goal. The hc3 Lifestyle Program includes a Program Guide that provides a menu of foods and quantities you should eat. The Eliminator Packs DO NOT include a Program Guide therefore YOU make your own decisions regarding what you eat and when. The assumption is that you are already knowledgeable of an appropriate selection of natural, whole foods. 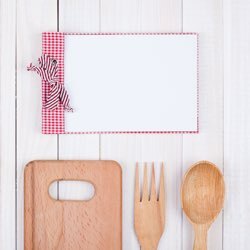 SupplementRelief.com provides many free resources on our website to help you live healthier including great-tasting recipes in our Healthy Living Whole Foods Cookbook, our blog Your Healthy Life Concierge, and in-depth articles and webinars about Wellness topics covering nutrition, stress management, proper sleep and fitness. 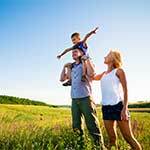 The Resources tab on this page has a specific selection of these resources to get you started. 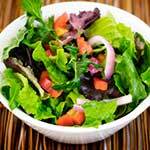 *Optimal weight and body composition requires a lifestyle of eating healthy, nutritious whole foods. Active Complex: Shake well. Take one dropper full in 2-4 ounces of water twice daily (morning and afternoon) or as suggested by your healthcare practitioner. Appe-Curb: Take four capsules before breakfast and four capsules before lunch or at mid-afternoon (2-3 pm) or as directed by your healthcare professional. Do not take after 3 pm. Melatonin Liquid: Shake well. Take one full dropper (1 ml) just prior to bedtime as needed. MultiMedica: Take four capsules daily or as directed by your healthcare practitioner. SlimFit Protein: Stir or blend 2 scoops (60 grams) into 8-10 ounces of water or as directed by your healthcare practitioner. 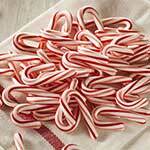 To increase sweetness, use less water. To decrease sweetness, add more water. Total Vegan Protein: Stir or blend two scoops (44.3 g) into 10-12 ounces of cold water or as directed by your healthcare practitioner. To increase sweetness, use less water. To decrease sweetness, add more water. Here are some quick tips for hc3 trim dieters who need a little extra boost for their weight loss! Brandy's Weight Loss Journey: Part 1 - Meet Bandy! Welcome our weight loss volunteer: Brandy. She is looking to lose weight before her 30th birthday. Let's see how she does! 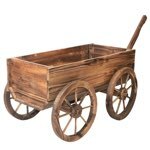 Brandy's Weight Loss Journey: Part 2 - When You Fall off the Wagon! 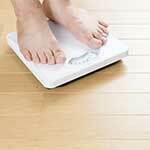 5.6 pounds of weight loss in one week, even with a family emergency? Way to go Brandy!! Observations from our volunteer, Brandy, on her weight loss journey with the NuMedica hc3 Trim Lifestyle Program. 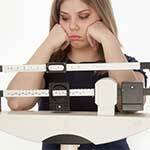 Brandy's Weight Loss Journey: Part 4 - Why Do Diets Fail? Today we conclude Brandy's weight loss journey where we discuss the common pitfalls of "diets". 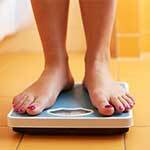 Do you have a weight loss goal? How are you planning for it? Without a plan, you will almost certainly fail. Do you binge eat? 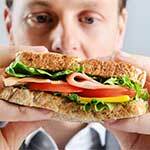 Many people eat for comfort when they are stressed, but how can you overcome this habit? Learn what it was like for Julie as she went through the NuMedica hc3 Trim Lifestyle Program in this 5-part series. Julie shares today that food is a comfort tool for her, and she's finding new ways to overcome bad habits. 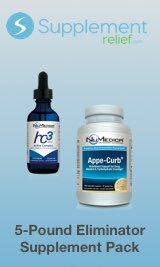 Wonder if NuMedica hc3 Trim is right for you? See Julie's ongoing progress and get her feedback. 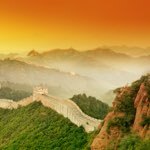 In Her Own Words: Part 5 - Weight Loss Success! 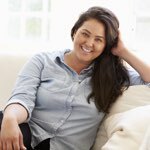 Forty days on NuMedica hc3 Trim Lifestyle Program: Final Results Are In! What Can I Eat on hc3 Trim? 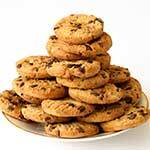 So many people contact us and wonder, "What do I eat on a hc3 Trim Diet? Let me show you how simple it is. When paired with healthy eating, hydration, and exercise, you'll be fitting into that one-size smaller outfit in no time. With the best ingredients from each of the other Eliminator packages, this is the Gold Standard of Weight Loss at SupplementRelief.com. 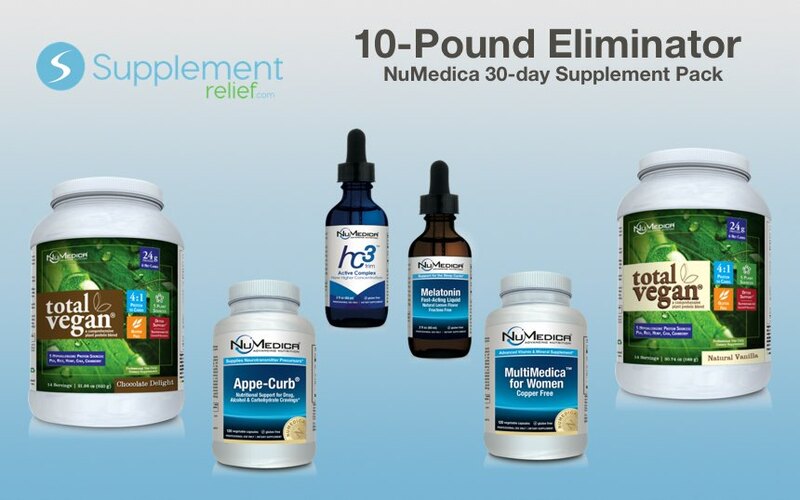 Three quality NuMedica supplements that when combined with diet, exercise and nutrition, help to burn fat, eliminate toxins, and nourish your body properly. 30-day comprehensive program designed to help the body burn stored fat as its primary energy source without decreasing muscle mass. 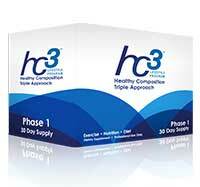 30-day weight management program helps to reset the body to a healthy metabolic state after a low-calorie diet such as hc3 Lifestyle Program.